Halloween is sneaking up on us. The holidays are not far behind. These days come with plenty of snacks with chocolate, vanilla and many other kinds of flavors. What if you could buy a snack and save a life at the same time? What if on Halloween or Thanksgiving you could share the joy and feed a “silent guest,” a starving child a world away? 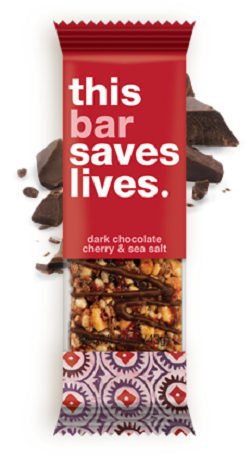 There actually is a way with This Bar Saves Lives, a new granola bar with chocolate, vanilla and wild blueberry flavors. Each purchase of this bar means a donation of the miracle food Plumpy’Nut, a peanut paste fed to children suffering from severe malnutrition. Malnutrition can cause lasting physical and mental damage in small children under the age of five. If the malnutrition become severe children may perish. In many developing countries afflicted by war, disasters or extreme poverty, small children are vulnerable to malnutrition. When food supply systems break down in a country, families can be forced into desperation with little rations. They look to humanitarian aid agencies for help. Plumpy’Nut can rescue the smallest children, if there is enough supply on hand for aid groups. Within the last year Save the Children has been fighting child malnutrition in South Sudan. In Eastern Equatoria, a state in South Sudan, crops had failed and families were resorting to wild fruits to survive. More cases of malnutrition had to be treated at Save the Children health centers there. Plumpy’Nut was used for the most severe cases. Conflict in Jonglei, South Sudan also has escalated malnutrition among children thus increasing the need for Plumpy”nut. When funding is low aid groups like Save the Children may be forced to cut back on this life-saving food. The consequences are devastating. Opportunities like This Bar Saves Lives gives people a world away a chance to help. Just as after World War II when Americans fed “silent guest” at their Holiday meals, you can be doing the same in the coming weeks and months. Your “silent guest” might be a child in drought-stricken West Africa, or in war-devastated Syria or Mali. You can help them get the Plumpy’Nut that will save their lives.